Edwardian conservatories are the most popular design. This is in part due to the fact it has a similar roof as the Victorian but is a more efficient use of space due to its rectangular footprint. Cost wise you also get more space for your money. Edwardian conservatories can also be combined with our livin-room boxing, cornice and Loggia columns transforming a conservatory into a more efficient room. As all our products are made to measure, the choice is endless. 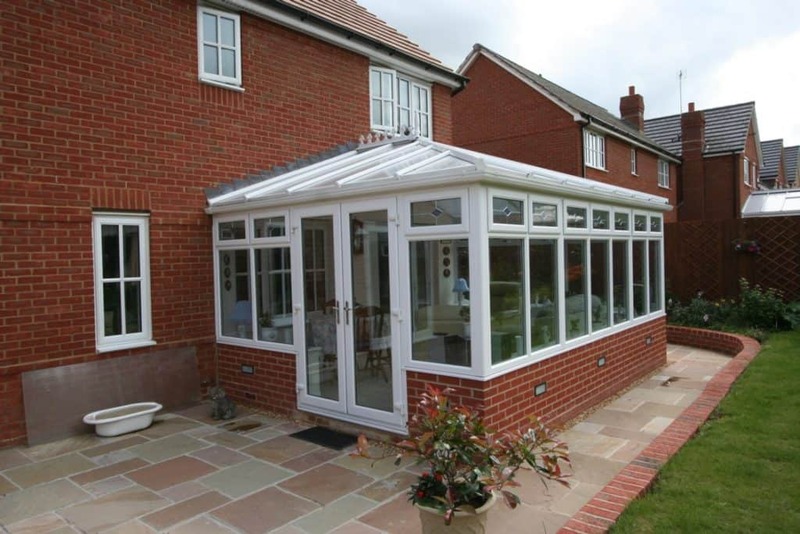 Using our free design service our professional representatives will ensure your new conservatory will meet your requirements. With a combination of ventilation, heating, energy efficient glass and reflective glazing a Test Valley Conservatory will help keep your new living room, cooler in summer and warmer in winter. The right combination will allow you to be comfortable in your new room all year round. Test Valley Windows always strive to fit the newest technology so we can offer our customers one of the best products in the market. 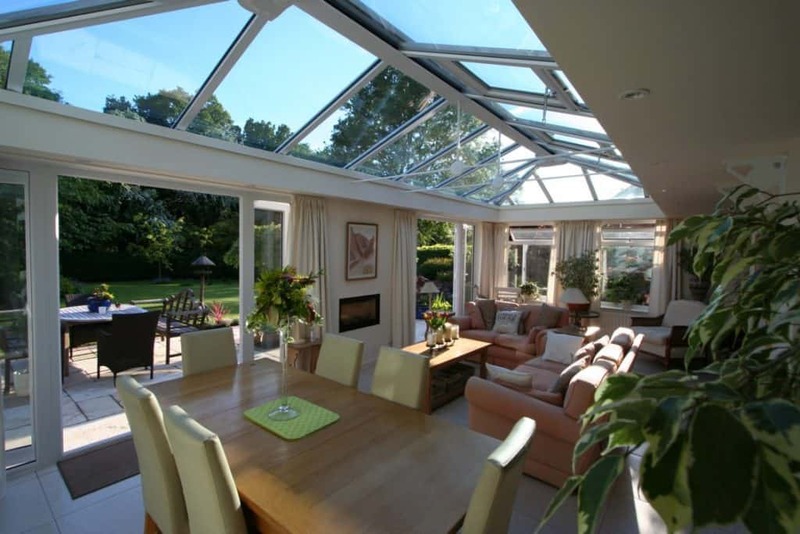 With a conservatory it is certainly not worth installing the cheapest, however using many years of trading, with our suppliers, you will be surprised at how competitive our prices are. The conservatory facets are made up of windows, doors and walls. The choice is based on, your preferred design, ventilation requirements, structural parameters and size. French, New Wave, bi-folding or patio doors will all fit into an Edwardian conservatory. Ventilation will be based on your preferred design and the aspect (south, west, north or east facing). The outer walls tend to match the finish of the property, though it is also popular to make a statement, with a different finish and therefore a clear definition between old and new. Frames are linked using structural joiners and posts, Loggia columns, brickwork or blockwork, to ensure that the weight of the roof is transferred to the walls and foundations and not through the frames. Internally, your new conservatory again will be finished to your requirements. Walls can be brick, plastered or panel finished. The internal frames do not have to be the same as the external with dual colours and grained finishes available in all our conservatories. There are numerous options for; skirting, window boards, eaves trim, lighting, heating, electric sockets, overhead fans, handle finishes and flooring. The above picture shows a Liv-in Room boxing between the top of the frames and the roof which incorporates LED spot lights, and an LED up lighting strip to the top. You will notice that the roof is hipped at both ends and is called a double hipped Edwardian. Click to view building a conservatory slide show. Click the link below to view our roof options for glazing, decor and roof ventilation. To view our Liv in Room roof and Loggia column options, please click the link below. Over a quarter of all domestic heat loss escapes through windows and doors and with spiralling energy bills this can add up to a lot of wasted money. The single most important factor, relating to the energy efficiency of a window, is the glass. By combining SGG PLANITHERM TOTAL+ with other specialist glass products available, a multitude of high performance, multi-functional double glazing solutions can be achieved. The SGG COOL-LITE family presents an extensive range of solar control solutions, designed to reduce solar heat gain, thereby reducing reliance on ventilation and air conditioning systems. SGG BIOCLEAN can be combined with SGG PLANITHERM TOTAL+ to add effective self-cleaning properties to a double glazed unit. This product combination offers a significantly more neutral and less reflective solution compared to equivalent products currently available on the market. SGG STADIP SILENCE is an acoustic PVB laminated glass, which noticeably reduces noise while also offering the same safety and security characteristics as laminated glass. Window Energy Ratings Combining SGG PLANITHERM TOTAL+ with SGG DIAMANT low-iron glass in the outer pane can improve the energy index of a given window by further increasing solar gain. Triple Glazing is an excellent option for conservatories because the extra pane of glass reduces solar gain and improves the thermal efficiency. The inner panes are constructed using two panes of Planitherm Total+and the outer is the glass of your choice, tinted, self-cleaning, clear etc. We always toughen the centre pane to reduce the risk of stress fractures which is more common in triple glazing. Add a touch of class to your conservatory with a bevelled or stained glass design to fan lights. We have over 100 standard options. If you do not see one, you would like you can design your own, and we will make it for you. Below are just a few examples. For side frame specification, please view our window and door sections. Wake Up Your Life With Cold Showers!